Adorable figurine by Homeco. Made of hand painted bisque porcelain. 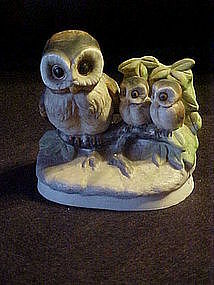 A mamma owl and her two young babies sit on a limb. Measures 4" tall and 4" wide. Perfect condition with no chips, cracks, or repairs.Add this to your bird collection. I have the other matcjhing "Right" one. This is the left.